Hayari Parfums Paris Floral Trilogie, so chic and classic, homage to the French Classic elegance. 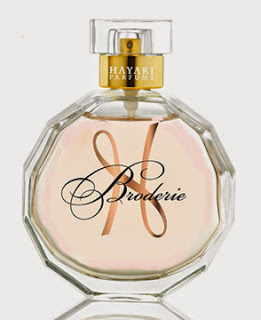 I was beyond flattered when PR invited me to sample a series of fragrances by Hayari- Parfums Paris. This high end, prestigious line was founded by prominent fashion designer, Nabil Hayari in 2009. As a designer, his artistic vision reflected his adoration for timeless grace and elegance with his usage of crystal beads, lace chiffon, and silk taffeta. Elements like these embody grace and femininity, both of which transcend into his fragrances. I was sent Goldy, Broderie, and Only For Her, each part of an impeccably crafted trilogy. A set that was inspired by white flowers, and the glamorous Parisian values of the Hayari Couture House. I couldn’t help but reach Goldy first. Its delicately crafted packaging recently won the Member’s Choice Fragrance for Best Package Design Innovation of the Year and I was already drawn to its intriguing scent seeping from its package.. It contains base notes of sandalwood, musc, and cedar wood, blended with Narcissus orange blossom and white jasmine for a middle, and a top note of mugwort rosemary. Described best as a woodsy-powdery scent, it is a perfect balance of the two. It is a warm scent that would be appropriate for any evening, upscale occasions. When worn, I felt as though it exuded sophistication and a sense of regal elegance. Next, I spritzed on Only For Her and nearly saw the heavens part. This scent is divine! Designed to pay homage to the French Classic elegance, it opens with fruity notes like freesia grapefruit and white peony, drying down onto a velvet bed of patchouli, sandalwood and creamy vanilla. Only For Her embodies everything I look for in a fragrance. It is light and fresh, but definitive enough to get you noticed. While wearing it, I felt as though I’ve never worn anything like it. It is composed of a genius formula, which I now believe to be timeless. It exudes a subtle but sultry allure that leaves you craving more. It is a necessary staple for a well rounded fragrance collection. Broderie is a beautiful fruity floral that is oh so chic and classic! Used frequently in Hayari’s collections, embroidery and lace set the stage for this delicate blend of mandarin peach, gardenia incense, sandalwood and amber notes. This is a delightful summer scent that wears lightly, and is very flirty. I wore this everyday and many evenings as it is appropriate for both, however, Broderie is not your typical fruity floral. I loved wearing this scent because while it brings out a woman’s confidence, it also possesses a unique twist that plays innocently to her heart. I felt carefree and elegant all at the same time. Have you tried this trilogie of fragrances? If so, which one is your favorite? Samples were provided complimentary by PR for review, but that in no way influences my reviews.